Ladd’s Addition is one of my favorite neighborhoods. It’s an area of town that almost reminds me of Europe, with it’s traffic circles and diagonal street design. Ladd’s Addition is also home to some of the best Old Portland architecture you’ll find in town. Walk down any street, and you’ll find a mixture of Old Portland home styles. 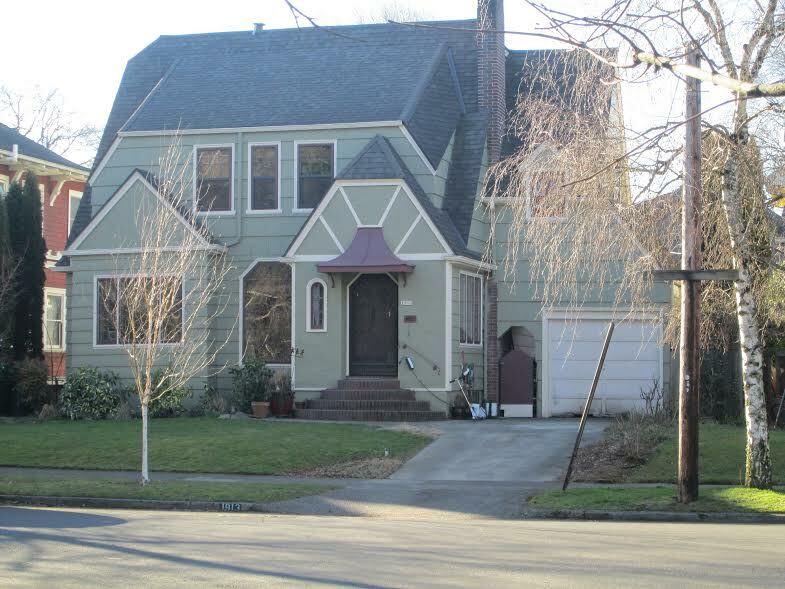 I took this picture on one of my walks with Positively Portland Walking Tours, so it just seemed natural to ask Eric Wheeler to explain what type of house this is. What is a Tudor Revival? The pictured house is a one and a half story residence that fits into the general category of a Period Revival style. Tudor, Gothic, Spanish Colonial and Mission are all specific revival styles that were very popular in Portland in the 1920s, often called the “between the World Wars” era. This decade was also a time of great prosperity, especially in urban America, and many of our historic neighborhoods were filled in during this time period. The 1920s in Portland was a time of population growth and feverish building activity that came to a screeching halt in 1929 with the onset of the Great Depression. Mock half-timbered gable end on the entry. Mock half-timbering is one of the most visibly reliable indicators of the Tudor Revival style. Clipped gable ends on the left end of the main roof and on the entry roof. The clipped gable is a visual identifier of the Craftsman influence in this house. Tudor Revival and Craftsman are both American styles that evolved out of the English Arts and Crafts Movement. The massive shed roof dormer ends echo the angular look of the clipped gables described earlier. Notice the slender, round-arched “peek-a-boo” window on the left side of the entry, providing visual relief from an otherwise angular exterior façade. The “bell cast” metal roof on the entry canopy also adds a bit of curvilinear detail to the façade. The twin flanking, projecting gables on the first story are similar, but not identical….one clipped and one not. This is a common Tudor element designed to align the style closer to the consciously unbalanced façade of the Arts and Crafts tradition and away from the symmetrical Colonial/Classical appearance. The attached single car garage (likely original) also fits this house neatly into the early automobile era when the English-inspired Tudor Revival was popular. By the 1920s most Americans could afford to own a car. You will see many variations of the popular Tudor Revival style as you walk, drive or bike around old Portland neighborhoods. Thanks Eric! If you want to learn more about Portland neighborhoods and their styles and personalities, join Eric Wheeler on one of his tours with Positively Portland Walking Tours. Have you seen a Tudor Revival recently?